18th January 2019, New Delhi: Many consumers are complaining that they are yet to receive benefits of previous GST rate reductions that were implemented in Nov 17, July 18 and recently on Jan 1, 2019. While white goods and FMCG brands show an improving trend of rate reduction benefits being passed, according to consumers, the trend for restaurants passing these benefits is not encouraging. Over 60,000 consumers from across India are connected via India’s Anti-Profiteering community founded by the National Anti-Profiteering Authority and hosted on LocalCircles. 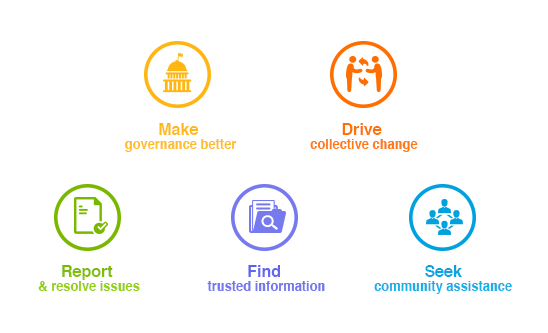 The community allows a citizen to share a profiteering experience, ask queries and raise their complaint to NAA while making thousands of other consumers aware about the issue. 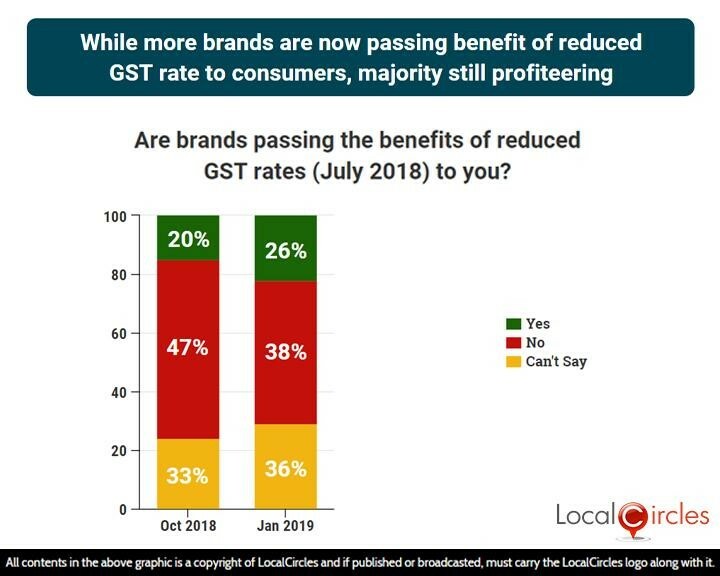 To gauge the consumer pulse on how GST rate reductions are reaching consumers, LocalCircles conducted a 3-point poll. Over 23,000 votes from 15,000 consumers was received from across India. GST on restaurant bills was reduced from 18% to 5% in Nov 2017 with the withdrawal of Input Tax Credit for restaurants. Citizens were asked what their most common experience has been since then. 51% said that no benefit of the lower benefit is being passed on as the base prices has been increased. 19% said restaurants are passing full benefits of the lower tax to the consumers while 10% said only partial benefit is being passed on. 20% were unsure. 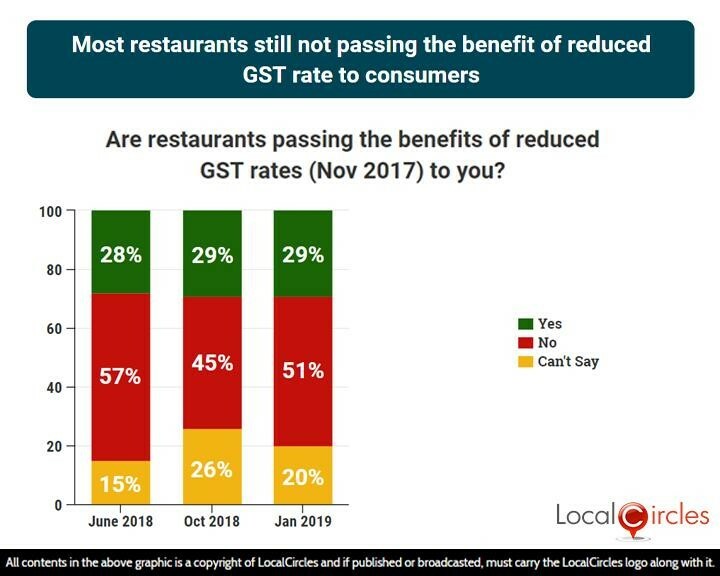 The comparison indicates that the number of consumers saying that the restaurants are not passing benefits of reduced GST to them has increased from 45% in October 2018 to 51% in January 2019. Those saying restaurants are passing the benefits, has stayed constant at 29%, when compared with the October pulse check. 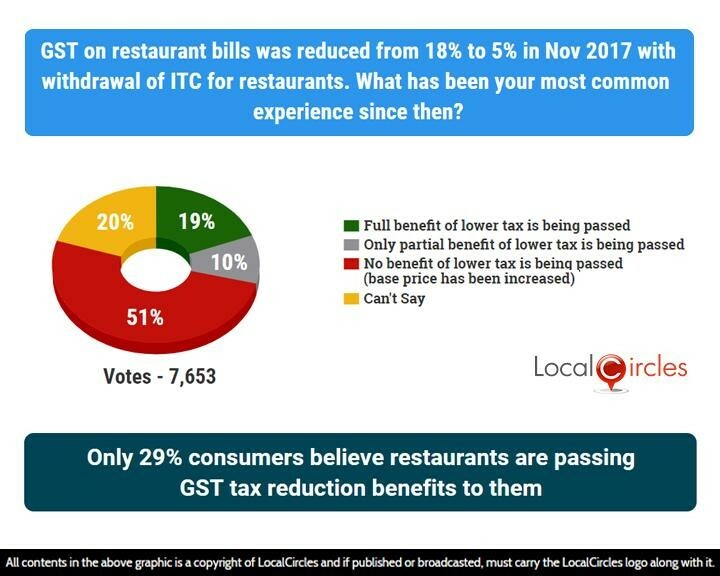 This indicates that many restaurants have decided not to pass the GST rate reduction to consumers, or else the percentage would have shown a continued increase. GST rate on many items like shampoo, cosmetics, groceries etc. was reduced from 28% to 18% in Nov 2017. Consumers were asked if the brands had passed it on to them. 44% said no benefits were being passed as the base price of products has been increased and 6% said full benefits were being passed on. 21% said only partial benefit of the lower tax is being passed on while 29% were unsure about it. When compared with the October 2018 pulse check, number of people saying brands are passing on the benefits on November 2017 GST rate cut on cosmetics, groceries etc. have increased from 22% to 27% in January 2019. This indicates that while there is a long way to go before all brands pass GST rate reduction benefits to the consumers, the number of consumers receiving them is rising. GST rates on items like paints, home appliances, televisions etc. was also reduced from 28% to 18% in July 2018. 38% consumers still say that none of these benefits are being passed on to the them as the companies have increased the base price of the product. 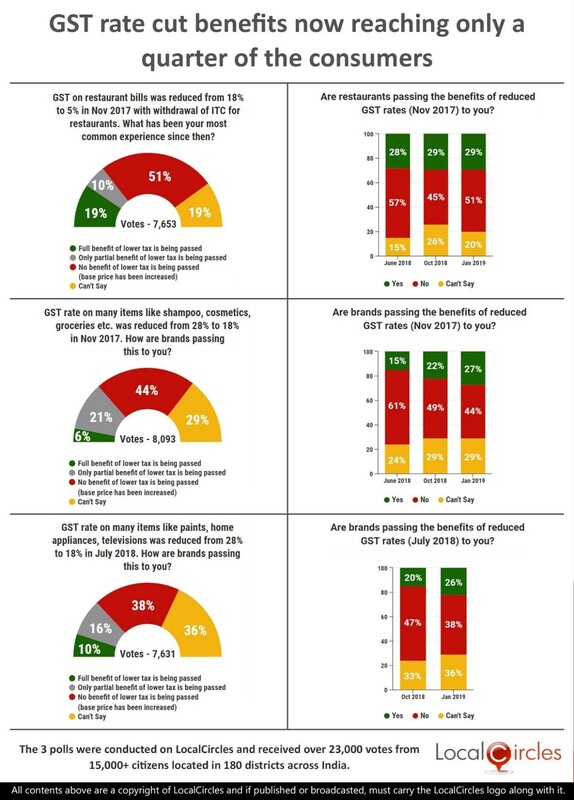 10% said full benefits of lower tax are being passed on to the consumer while 16% say only partial benefits are being passed on. 36% were unsure. 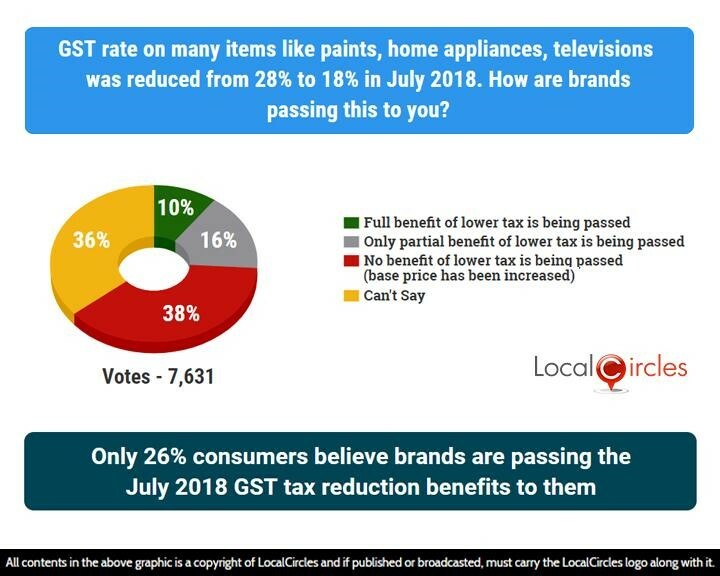 20% citizens in the last pulse check had said that brands are passing on the benefits of July 2018 GST rate cuts to the consumer. This number has increased to 26% this month, again indicating that more consumers are receiving the benefit of GST rate reduction. LocalCircles had also written to 25+ GST commissioners from across the country that cover manufacturing of most of the products that were included in the Nov 17 and July 18 rate reductions, requesting them to communicate to businesses in their areas about passing the GST benefits to consumers via revised MRPs.